Tea drinking has become a way of life. To put it frankly, it is a love, an addiction, and some would even go as far to say a philosophy. Dr. Keith Souter examines the perpetual impact that this adored beverage has bestowed upon the world for centuries, from its mystical origins in the East, to its inevitable influence on the West. 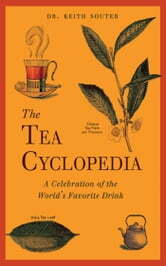 The Tea Cyclopedia is an indispensable reference for anyone interested in all things tea. Commencing each chapter with insightful quotes, it not only captures the historical beginnings of this beloved drink, but also explores tea's involvement in politics, health, the economy, and even fortune-telling. This unprecedented beverage has united people in times of adversity; it has also divided nations, causing volatile revolutions, such as the Sri Lankan Civil War and the Boston Tea Party. But today you will most likely find that various cultures have developed their own unique style of enjoying tea, and the ritual of tea drinking itself is not only intriguing, but also highly rewarding. In this meticulously detailed guide, readers will rediscover tea, its cultivation, and all of its richness and intricacy as a worldwide beverage. The Tea Cyclopedia is an enthralling tribute to the illustrious, invigorating, and elusive leaf that has vehemently continued to inspire people for more than two thousand years.